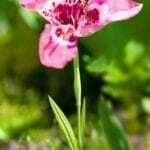 I planted tiger lily bulbs last fall, which are growing nicely. They are about 14-16 inches tall but while out in the garden, I accidently snapped about 5-6 inches off the top of one. Will it continue to grow and flower this year, or will I have to wait until next year? Most likely, they will not bloom this year. There is a chance though that they will grow an offshoot from the main stem and this will bloom.